In Part I of this 2-part article, I committed to analyze and critique real-life TV ads to see how they do at engaging me (and my many devices) while I watch TV in my living room. I did this exercise while watching NBC’s The Voice program during “blind auditions.” Yes, I’m addicted to this show, and yes it’s a guilty pleasure. Don’t judge! 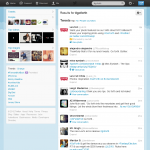 Frequency – Is the advertiser spending tons of money on a single campaign? Landing page – How does the experience look and feel on my device of choice? Does it meet my expectations? Is it fast? Multi-channel + Multi-device – Is the transition from channel to channel, and device to device, feel smooth and elegant (or disjointed and awkward)? After reviewing my list of ads and evaluating some scenarios, I chose 3 ad campaigns as good examples that were either doing things well, doing things poorly, or both. The ads for this were all over The Voice while I was watching. They had no explicit CTA, so they’re relying on the strength of their core message to drive traffic into stores or online. A risky bet, if you ask me. 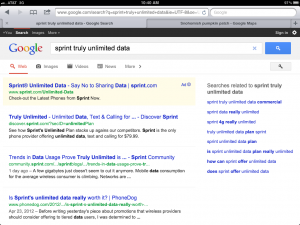 I searched on my tablet for “sprint truly unlimited data” to learn more. They have done a good job of “owning” the top 3 results for this keyword, one of which was a highly targeted PPC ad [click to enlarge]. 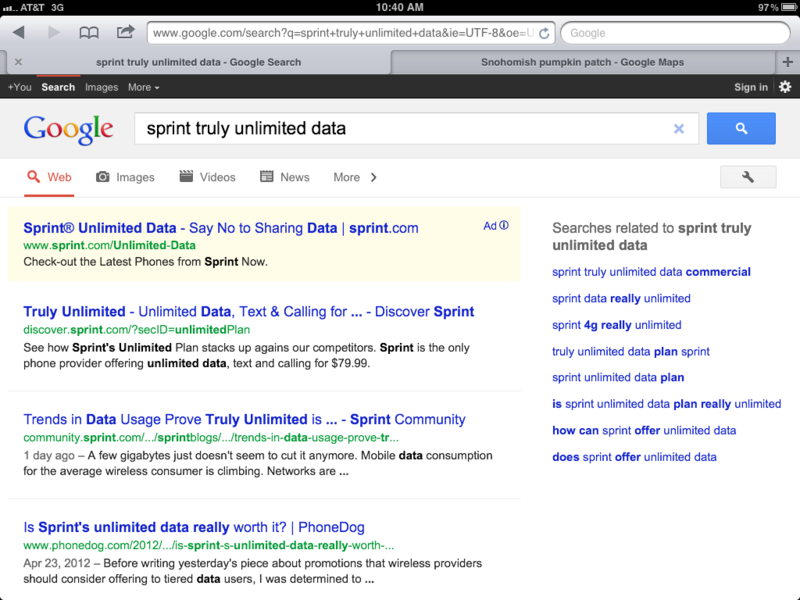 I clicked on the paid search ad to see what the landing page would be like. I have to say that the PPC landing page [click to enlarge] had some good things going for it. It had a strong headline, clean layout, and a comparison chart to help substantiate their claims. The ability to “toggle” the display of the comparison chart was confusing and unnecessary, though. Curious about the strong “Start Shopping” call to action, I clicked. 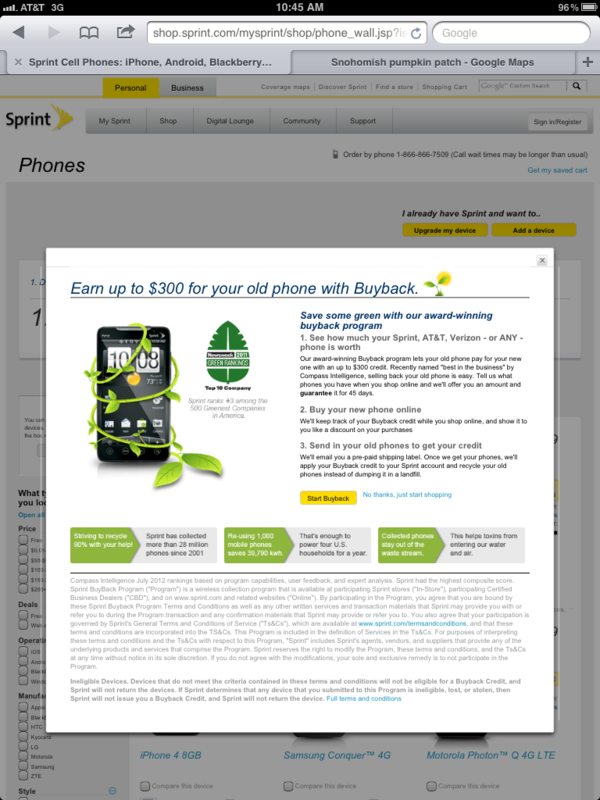 Once in their store, my experience was interrupted by a modal overlay telling me about a buy-back program [click to enlarge]. 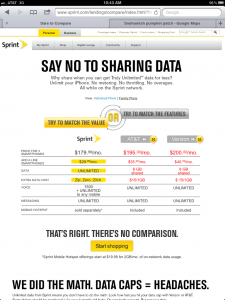 On one hand, it wasn’t really relevant to buying into Sprint’s unlimited data concept. On the other hand, it may be providing an important incentive to get the curious, passive shopper to become more serious and active in their quest for phone service and/or a new phone. 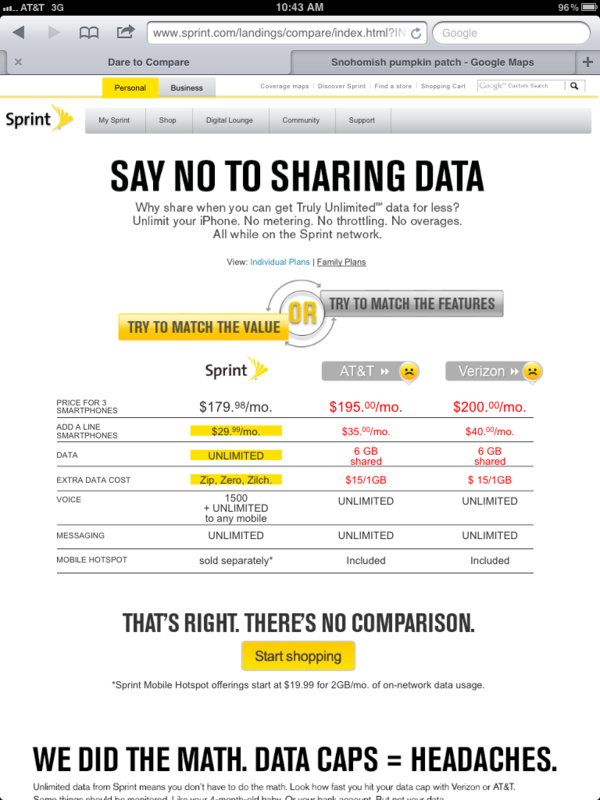 Also of note was that all the sprint pages loaded really slowly, which indicates they are probably just regular ol’ web pages, not optimized for a mobile/tablet experience. Overall, I give the experience 6 out of 10. I liked that they provided a vanity URL in the ad (kmart.com/sofiavergara), but why couldn’t it just have been “/sofia”? Half of America, myself included, would probably have trouble spelling her name correctly in the address bar! Anyway, like the sprint landing page, this Kmart page loaded very slowly on my tablet, again indicating it was not optimized for the device most used while watching TV. 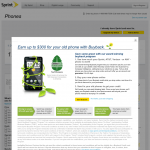 The “scent” from the ad to the landing page was very strong, though [click to enlarge]. You immediately can tell you’re in the right place scanning the page, as Sofia’s face is all over it. Also, the page title is well-written. My critique here is that valuable above-the-fold real estate is wasted on Kmart’s “other” women’s collections, which are essentially distracting from the main CTA, which is to shop/browse Sofia’s new collection. Overall, a strong showing and a 7 out of 10 score. The most interesting campaign I followed, in terms of being complex and multi-channel, was the Levi’s “go forth” commercial that’s been airing during The Voice. This is the ad with the spoken word piece about kids and their jeans. 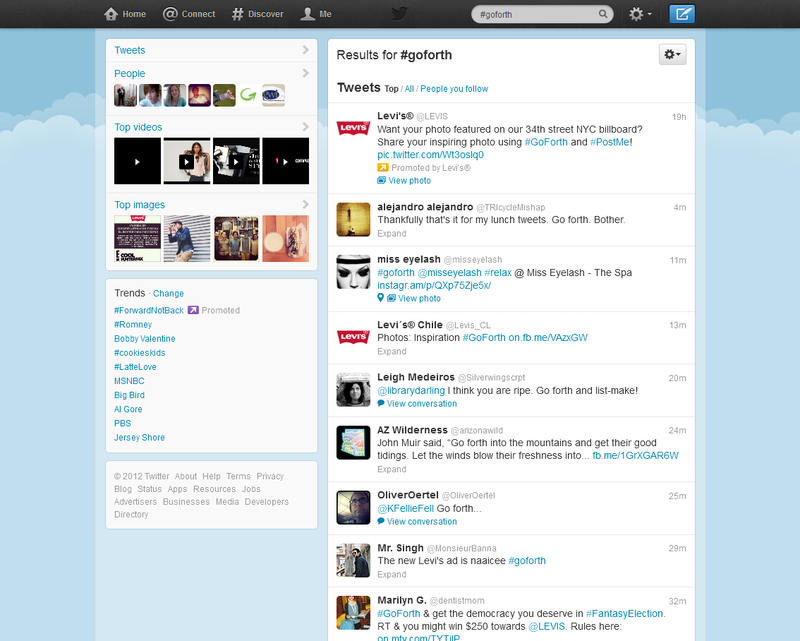 I immediately went to Twitter to check out the “#goforth” hashtag, since that’s how they’ve branded the campaign in the first place. Sure enough, you see a Levi’s tweet pinned to the top of the stream. 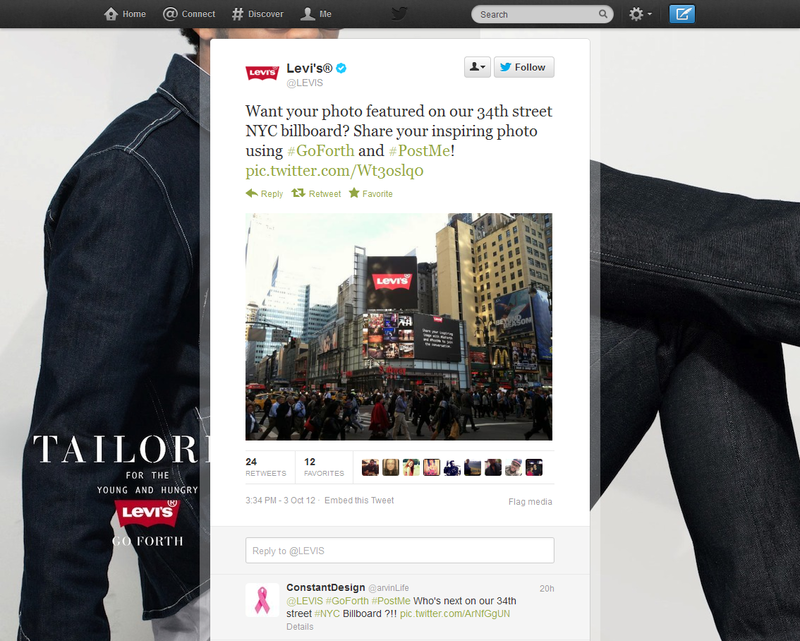 It’s definitely an “engagement” call to action, asking people to share photos for a chance to be on a prominent Levi’s billboard ad [click to enlarge]. 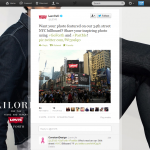 After clicking on what I thought was the main CTA, I was taken to another Levi’s branded Twitter page, repeating the exact same message [click to enlarge]. My critique starts here. The campaign idea seems well-conceived, and compelling, but the actual digital experience was to me lengthy and confusing. It’s just not clear how to engage with this campaign by uploading photos. And, I can’t help but wonder about adding some “commerce” into this campaign, like “runners up” in the billboard contest get 50% a pair of Levi’s? Overall, points for creativity are balanced out with deductions for confusion. A 5 out of 10 score. Note: I did all this on a tablet. You can guess how these experiences would’ve been on mobile…worse! I simply didn’t have the patience to try to slog through these experiences on a phone. What do you think of these examples? What would you have done differently if you were creating these TV ads or in charge of the digital experiences that followed? This entry was posted in channel marketing, Mobile and tagged kmart sofia vergara, levis go forth, multi channel, multichannel, multichannel marketing, new multiscreen world, sprint truly unlimited data, television, television advertising, tv, tv advertising by brendanr. Bookmark the permalink.